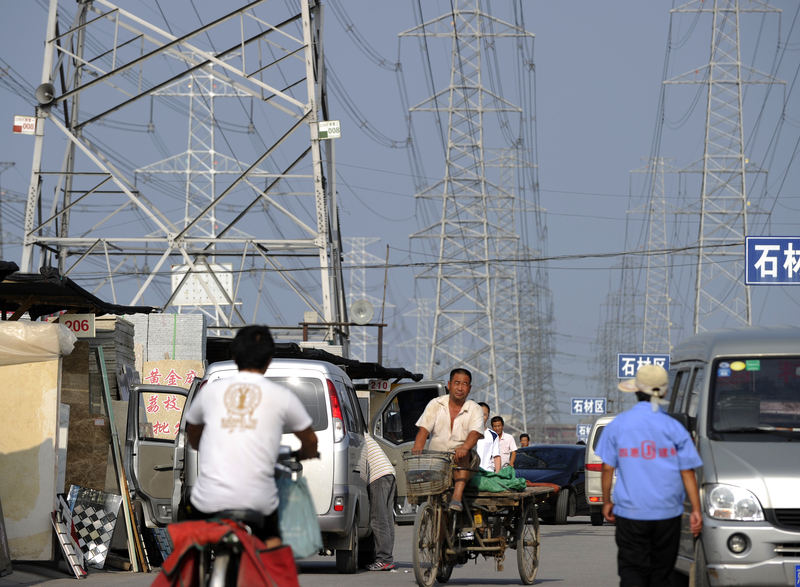 A migrant worker rides a tricycle past the power grids at a market in Beijing. Chinese policy goals call for a move away from heavy industry toward a less energy-intensive economy, with a greater focus on service industries. As the world’s top producer of energy-intensive goods, China’s energy consumption is tied to both its rate of economic growth and the size of its energy-intensive manufacturing industries. Chinese policy goals call for a move away from heavy industry toward a less energy-intensive economy, with a greater focus on service industries. 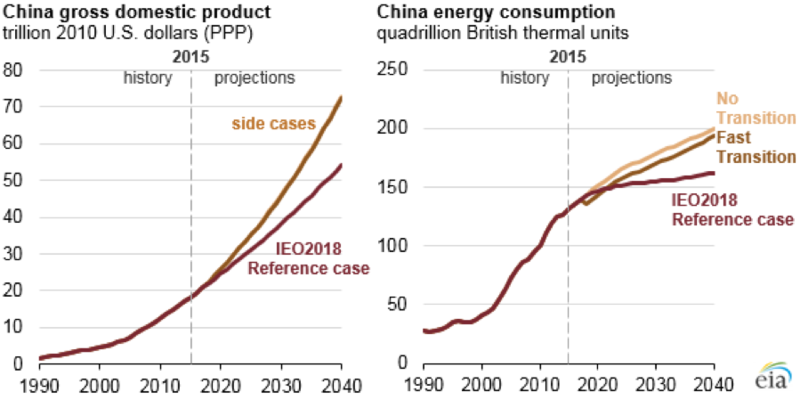 Two side cases from EIA’s International Energy Outlook 2018 (IEO2018) show that faster economic growth in China means higher energy use, which is only modestly affected by how quickly China transitions to a more personal consumption-based, service-oriented economy. China’s 13th Five-Year Plan, adopted in March 2016, includes several objectives to prioritize the production of goods that are less energy intensive. 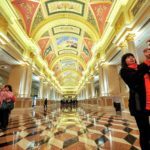 Another objective is to raise the service sector’s share of China’s gross domestic product to 56 percent by 2020. The IEO2018 Reference case assumes that China gradually transitions to an economy with greater personal consumption and a larger service sector as a share of total production. Two IEO2018 side cases consider the energy implications of faster Chinese economic growth, but they vary as to whether or not China’s economy transitions to a more service-oriented economy or remains similar to its current structure. These two side cases assume a greater rate of GDP growth than the IEO2018 Reference case: Real Chinese GDP is projected to grow by an average of 5.7 percent per year between 2015 and 2040, compared with 4.5 percent per year projected in the IEO2018 Reference case. The cases differ by the components of GDP responsible for this increase: One focuses on higher investment and exports compared with the IEO2018 Reference case, and the other focuses on higher personal consumption. In the “no transition” case, investment—purchases of structures, equipment, and software by businesses or governments—accounts for a larger share of GDP in 2040 than in either the IEO2018 Reference case or the “fast transition” case. The production structure of China’s economy still shifts to services, but at a slower rate than in either of the other two cases. Delivered energy consumption increases 28 quadrillion British thermal units (Btu) higher than the Reference case in 2040, or 23 percent higher than 2015 levels. In the fast transition case, personal consumption—all of the goods and services purchased by consumers—accounts for a larger share of GDP in 2040 than in either the IEO2018 Reference case or the no transition case. China’s shift to services is fastest in this case: By 2040, services make up 48 percent of China’s gross output. China’s total energy consumption increases by 23 quadrillion Btu, or 19 percent higher than the 2015 level. In both cases, the manufacturing shares of the economy are similar—40 percent in the no transition case and 38 percent in the fast transition case. Manufacturing production tends to be more energy intensive than other sectors, and this relatively small difference between cases accounts for much of the difference in China’s energy consumption. 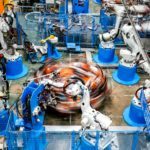 In 2015, China’s industrial sector consumed 71 quadrillion Btu; by 2040, that value is projected to be 85 quadrillion Btu in the slow transition case or 80 quadrillion Btu in the fast transition case. Changes in all other end-use sectors (residential, commercial, transportation) are relatively minimal. In both cases, China remains the world’s top producer of energy-intensive goods. 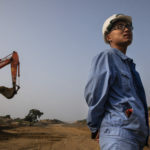 China, India, and Africa collectively accounted for 32 percent of global energy consumption in 2015, and in the IEO2018 Reference case, these regions are projected to account for 36 percent of global energy consumption in 2040. India is projected to be the most populated country with the fastest-growing economy in the world in the IEO2018. Yet even in three high economic growth cases for India—with GDP assumed to grow well above IEO2018 Reference case rates—Indian energy consumption does not reach that of China or the United States over the projection period. 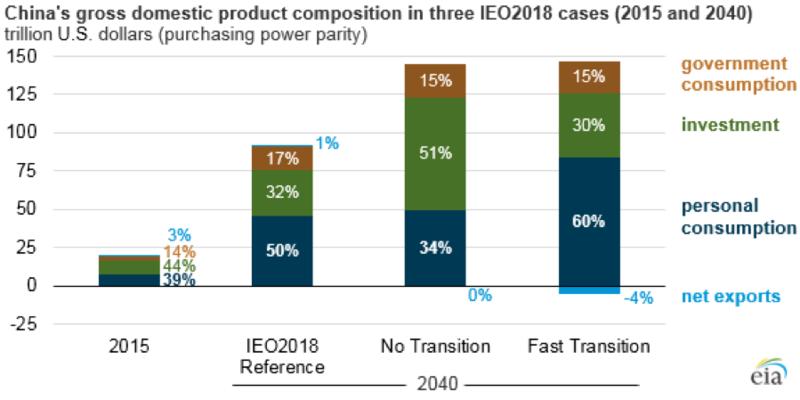 Within those three India-specific cases, the case where economic growth relies heavily on the expansion of exports results in the largest increase in Indian energy use compared with the IEO2018 Reference case in 2040. This side case also leads to nominal gross output from the energy-intensive manufacturing sector that is about 50 percent larger in 2040. Africa has a wealth of natural resources and a younger and faster-growing population than many other parts of the world—and potential for rapid economic growth. The IEO2018 Africa High Economic Growth case leads to African energy consumption per person that is 30 percent higher than the IEO2018 Reference case in 2040. This case also leads to an expansion of the African manufacturing sector and an increase in industrial energy use. Decision-makers in government and industry should understand that these are projections, not predictions. Long-term projections are based on assumptions that are highly uncertain. The IEO2018 results highlight some of the sensitivities to changes in these assumptions. Policymakers and business leaders should keep in mind the uncertainties around these projections and also the importance of economic growth assumptions for projections of energy consumption, particularly in fast-growing regions of the world. 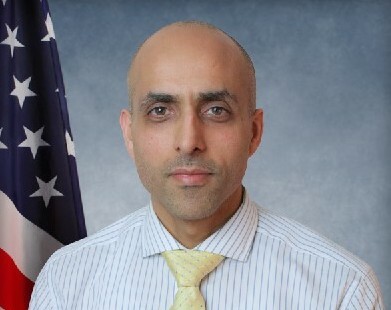 Vipin Arora leads EIA’s macroeconomic analysis team. The team supports major EIA publications such as the International Energy Outlook, Annual Energy Outlook, and the Short-term Energy Outlook. The macroeconomic analysis team also regularly conducts and publishes research and analysis on interactions between the energy sector and economies, including work on employment, trade, and output.